FRA FILIPPO DI TOMMASO LIPPI, one of the most important successors to Masaccio, was born in Florence in a side street called Ardiglione, under the Canto alla Cuculia, behind the convent of the Carmelite friars. He became an orphan at the age of two and was raised by an aunt. In 1421, he entered the monastery of Santa Maria del Carmine in Florence and was able to observe the decorative work in progress in the Brancacci Chapel. He used this experience in his first work, the frescoes in the cloisters of the monastery (1432), now only surviving in fragments, with their plastic figures and individual facial expressions. His Madonna Enthroned (1437), is, in her clear articulation, reminiscent of Masaccio’s altarpiece in Pisa. In the 1440s, complex movements and a restless treatment of drapery are discernible in The Annunciation (c.1442). These were the elements on which his great pupil Botticelli trained himself. With the decoration of the cathedral choir in Prato between 1452 and 1465, his artistic development reached its culmination, ranking him with Fra Angelico as among the most outstanding fresco painters of his time (c.1460-1464). Lippi was chaplain to Santa Margherita in Prato from 1456, but he had to leave the order as he had formed a relationship with the nun Lucretia Buti, who bore him a son, Filippino Lippi (born about 1457), who as a pupil and assistant of Botticelli was to give the latter’s late style certain Mannerist features. In his own late period, Fra Filippo Lippi painted various versions of The Adoration, with the Infant Baptist and St. Bernard (c.1459), the most famous being the one produced for the house chapel of the Palazzo Medici (now in Berlin, Gemaldegalerie). With its fairy-tale atmosphere created by light and shade, the rich use of gold and the magnificent flower carpet, this panel represents one of the finest achievements of the period. 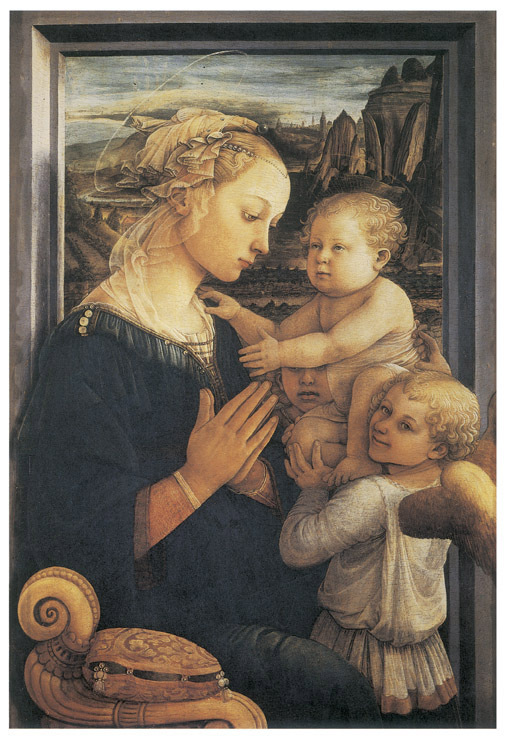 The Madonna with Child and Two Angels (shown above) is an extremely well-known and popular work that is considered as one of the highest and most lyrical expressions of Lippi's art. It is certainly a late composition, a distinct foretaste of themes, the tension and incisiveness of the line, the typology of the faces, and the tender melancholy expressed by the persons portrayed that would be developed by Botticelli, Pollaiolo, and Leonardo. The element of design is so greatly emphasized in this painting that it seems almost the artist's only means of expression. His color creates a soft light, and the play of light and shade, plus the transparency of the veils, creates the illusion of movement rather than of substance. In the context of this soft light, the suggestion of modeling in the face of the Madonna seems hardly more than a tremor. The delicate profile of the Virgin Mary, seated by the window, is outlined clearly against the rocky landscape, while two angels hold up the Christ Child, who reaches toward his praying mother. The angel in the foreground turns with an odd smile toward the spectator.